Please read the earlier articles about Zoom before you read this article. Windows and Plus key zooms in and Windows with Minus key zooms out the entire screen. By default the zoom is 200% but you can increase it up to 1600%. 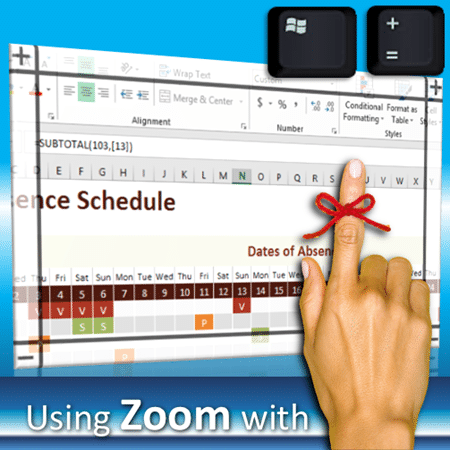 Once in zoom mode, the zoom region follows your mouse cursor or keyboard typing. All the features mentioned earlier work on Surface Pro. But because this is a TOUCH device, the magnifier has another great feature. Often touch devices are used WITHOUT keyboard or mouse attached. That is why it needs an easy way to navigate using touch. There is a thick but transparent border shown. On top you see two PLUS signs and at bottom two MINUS signs. Touch these icons to zoom in or out easily. Now what about the other border areas? Notice that they are an overlay which is semi-transparent. Move your finger along any of these borders to scroll the screen up / down or right to left. When you reach the edge of the actual screen, that scrollable border disappears to visually indicate to you that you have reached the end. For example, here it shows that I have reached the top and left edge. Question: How do I invoke magnifier using TOUCH? All along we have been using keyboard keys Windows + to invoke magnifier. If I don’t have a keyboard attached, how to do it? No problem. Use the On Screen keyboard and use Windows + shortcut. It works but now the Keyboard itself gets zoomed. You will have to pan the area and close it – which is definitely cumbersome. Now choose Change PC Settings option at the bottom. Now lots of options will come up. Choose Ease of Access. On the right side you will see a switch called Make everything on your screen bigger. Switch it on. That’s it. For some reason, it is not active on my Surface Pro. But there is another option just below (green arrow). Open the dropdown and choose Magnifier. Now you can press the WINDOWS logo on the device and press Volume UP button to start Magnifier. Finally, how do you close magnifier? When you start magnifier using touch, it will be zoomed in. There are those minus buttons on lower left and / or right corners. Either one or both of buttons will be visible. Touch the minus button to zoom out. Once you are fully zoomed out, you may want to zoom in again. Now Microsoft does not want you to go through the Settings menu or the Windows Up key all over again. Therefore even when you are fully zoomed out, it keeps few icons alive. At the top you see both the zoom in buttons – which is a very easy way to zoom in again. If you don’t want to keep it and get rid of the zoom all together, just touch the cross. Simple, convenient, intuitive and extremely useful. We must appreciate the amount of thought Microsoft has put in to make our lives easier. Once zoomed you require to choose which area to zoom into and how much zoom you want. Using Mouse this was done by moving the cursor and Keyboard Shortcut Windows + decided the level of zoom. In absence of both keyboard or mouse, this brilliant feature gives you the same facilities in a simple and intuitive way. You may wonder why the borders need to be touched to scroll… why not directly touch the central document area and try to scroll the view. This will NOT work because if you touch the document and try to scroll, the document will scroll – not the zoom area. For example, if you click somewhere inside the Excel worksheet and try to drag using touch, it will scroll the sheet – not the entire screen area. With mouse we don’t face this problem because mouse has a visible cursor which moves without affecting the underlying document or menus. This feature is not very well documented. So some people get confused when they see these + and – buttons and the big border. Don’t get confused. It is a really useful feature. Of course, the primary reason this feature is created is for Accessibility – for people who have eyesight problems. But we are also using it for making our demos and training more effective. Remember, each feature is designed with some need or problem in mind. But that does not restrict us from using it in other relevant situations. Finding new uses for existing features is also called Innovation! Try it. Use it and spread the word – Zoom the benefit!